Published on November 29, 2011 in Crime in T&T, General T&T, Hindu, India, Opposition Party, People's Partnership, Politics, Racism Watch and UNC. 2 Comments Tags: African, Calder Hart, Crime in T&T, Patrick Manning, Politics, Selwyn R. Cudjoe, T&T Govt. There is blindness among the leaders of the UNC government that will lead to its demise. Overconfident by the results of May 2010, it refuses to see that its victory was not so much an affirmation of their prospective policies (which were ill-thought out at best) but a refusal of citizens to accept what Mr. Manning and his team were doing. In rejecting PNM the electorate stated categorically that they were against Manning’s increasingly tendencies of one-manism, his refusal to listen to others; and his knee-jerk support of Calder Hart whose practices left many persons uncomfortable. Published on November 29, 2011 in Flooding, General T&T, Politics and Protest. 5 Comments Tags: Anthony Sammy, Diego Martin Regional Corporation, La Seiva, T&T Govt. 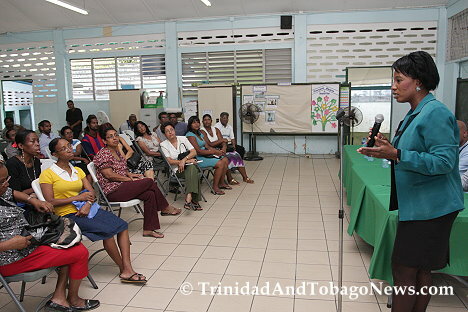 On Monday 28th November, 2011, residents of upper and lower La Seiva, Maraval, attended a meeting which purported to address their concerns following the landslides and floods which occurred last week. The Minister of Works and Infrastructure, Jack Warner, was supposed to head talks with the residents but was unable to attend. Members of the Ministry as well as the Chairman, Mr. Anthony Sammy and other representatives from the Diego Martin Regional Corporation were present to carry on with the meeting. Published on November 27, 2011 in Crime in T&T, General T&T, Law, Opposition Party, People's Partnership, Politics and Violence. 16 Comments Tags: Crime in T&T, Kamla Persad-Bissessar, Politics, T&T Govt. PRIME Minister Kamla Persad-Bissessar’s credibility is on the line with allegations of a plot to assassinate her and three of her ministers. This latest drama, coming at the tail end of a contentious State of Emergency, has drawn scepticism from many quarters. The PM and her security chiefs must now deliver the heads of the would-be assassins on the proverbial platter, or face loss of face and much more debilitating political fallout. 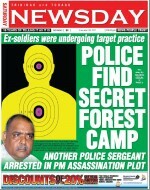 Published on November 25, 2011 in General T&T and USA. 7 Comments Tags: African, Kwame Nantambu, USA. As the Americanization of all aspects of life in Trinidad and Tobago continues unabated 24-7-365, it is a sine qua non that Trinbagonians be educated/informed in regard to the concept of “Black Friday” via this Afri-centric analysis. According to long-standing acceptable societal norms , “in the United States, Black Friday refers to the biggest shopping day of the year, which is always the Friday after Thanksgiving” (25 November 2011). Published on November 22, 2011 in Africa, Culture, General T&T, International, Race and Identity and Religion. 5 Comments Tags: Africa, African, Selwyn R. Cudjoe. Published on November 20, 2011 in Flooding, General T&T, Media and Politics. 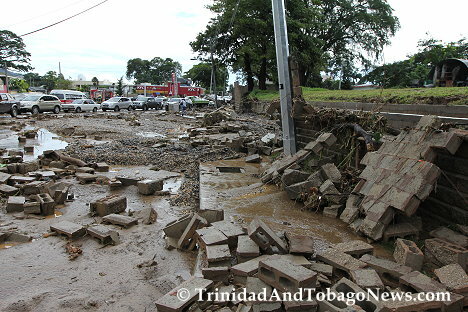 9 Comments Tags: Disaster, T&T Govt. St James Flood Nov 19th, 2011, 12:39pm; Bournes River overflowing at Patna Street Bridge and subsequently flooding Bournes Road and Western Main Road. Published on November 20, 2011 in Finance, General T&T, People's Partnership and Politics. 11 Comments Tags: Colour me Orange, Crime in T&T, Politics, Raffique Shah, T&T Govt. THERE has always been a “disconnect” between what Governments (note plural) say and what they do. The People’s Partnership’s first major policy document since coming to office 18 months ago, the Medium-Term Policy Framework (MTPF), is a comprehensive statement on where Trinidad and Tobago is today, its strengths, weaknesses and potential, and where the Partnership Government wants to take it in three years. Published on November 15, 2011 in Africa, Culture, General T&T, Hindu, India, Labour, People's Partnership, Politics and Racism Watch. 24 Comments Tags: Devant Maharaj, Kamla Persad-Bissessar, Racism, Sat Maharaj, Selwyn R. Cudjoe, T&T Govt.